Home » News archive » STREET SECTS…s." 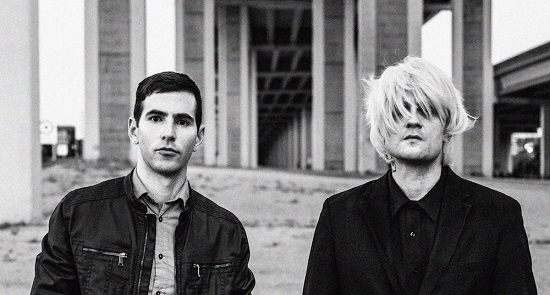 STREET SECTS: Reveal New Single "Still Between Lovers." Continuing to stoke the fiery anticipation around their sophomore album, industrial duo Street Sects have unleashed a crime-and-punishment deluge “Still Between Lovers.” Driven by metallic clatter and vocalist Leo Ashline’s neo-noir narrative, the track serves as the bridge between the calamity of the duo’s 2016 debut (End Position, 2016) and the forthcoming melody leaning LPThe Kicking Mule. Stream the track in full via Decibel Magazine. Continuing to redefine both themselves and the post-industrial canon, Street Sects have dug their heels even deeper into sample-driven noise while fleshing out chronicles of brutality (“glass in the tread of a tire / bone peeking through the skin”) and loathing (“At my worst I’m full of sentiment / At my worst I carry most of it around”) with The Kicking Mule. Known for their emotionally battering, fog-drenched live performances, Street Sects are eager to bring the catharsis of their industrial din to rooms across the country through December. A full tour itinerary can be found below. Street Sects formed in 2013 after vocalist Leo Ashline emerged from the fog of a thirteen year battle with addiction and began collaborating with friend and multi-instrumentalist Shaun Ringsmuth. Aching for catharsis, the duo embraced the experimental attitude and disillusionment of early industrial music pioneers, eschewing traditional rock music instrumentation and arrangement in favor of modern sampling technology and harsh electronics. The Kicking Mule will be unleashed to the world on October 26 via San Francisco-based label The Flenser. The album is available for pre-order here. Stay tuned for more updates. Top photo by Mike Manewitz.